Adventures in writing -- with photos. Max McCoy's BACKSTORY blog has moved. Please update your bookmarks. Thanks! THE SIXTH RIDER has reached No. 44 on Amazon's Top 100 list. As I write this, the Kinde edition of my novel THE SIXTH RIDER is now #1 in Kindle westerns, #3 in Kindle historicals, and #75 for all books. That's right, all Kindle books. Up 78,886 ranks from the day before. How did I land my novel in the top 100 Kindle list on Amazon? Now, giving away books seems like a foolish idea, especially when the numbers can run into the thousands. In fact, the number of ebooks given away in the last 24 hours exceeds the entire print run of the original Doubleday hardcover. But as any media weasel can tell you, the problem today is not throwing advertising at a mass audience, but figuring out how to reach just the right audience. In my case, readers who are likely to respond to the kinds of stories I tell -- dark and quirky (and I hope, literate). So, with no fanfare, I dropped the price on THE SIXTH RIDER from $3.99 to free to see what would happen. I'll spare you the details but the promotion was made possible by Amazon through a special program involving Amazon Prime. Kindle readers are apparently very hungry for good, free books. The promotion began at 3 a.m. Saturday, and the response has been dramatic. The proof is in the screen shot of my sales figure from Amazon's Author Central, top. On the face of it, it would seem I'm throwing away away thousands of dollars in royalties -- $13,950 in royalties, in fact, based on the thousands of copies given away so far. So, why would I do it? Simple: I want receptive readers. I've been frustrated in the past with the way publishers and bookstores have marketed my books. They always seem to be shelved in the wrong areas, or the covers suggest a traditional westerns, which I don't do. Some readers have even been angry that the book wasn't what they expected, and I can't say I blame them. I'd be mad, too. Take HELLFIRE CANYON, for instance. It won the Spur Award for Best Mass Market Novel from the Western Writers of America and also was named a Kansas Notable Book by the state library, but the cover and cover copy didn't remotely match what the book was about. With the Kindle books, at least the ones that I have the rights to, I can control the covers and the copy. In the case of THE SIXTH RIDER, I even asked Johnny D. Boggs, a noted western writer and former president of WWA, to write an introduction that would signal the tone of the book. I wanted to make sure that readers knew what they were in for. THE SIXTH RIDER has had steady but modest sales since being released as Kindle, but I always thought it could do better. The problem was finding a bigger audience. After all, my books get great reviews, they win awards, and I've have a small but passionate fan base. Now, in just one weekend, I have thousands of readers who were interested enough to download THE SIXTH RIDER and give it a try. And I think they'll like it enough to pay to give my other books a try as well, especially the trilogy that begins with HELLFIRE CANYON. We'll see. If it works, I'll let you know. If it doesn't -- well, I'll let you know that, too. The worst that can happen is that I gave a few thousand people a free copy of a book I believe in. And if you're reading this before midnight Sunday, Jan. 29, when the promotion ends, then click on the heading above. 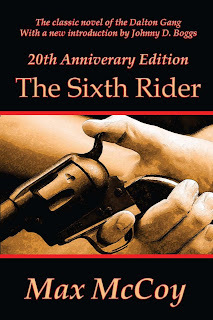 It will take you to the Amazon page where you can download THE SIXTH RIDER to your Kindle device. If you like the book, please blog about it or post a review. After all, you got it for free. Now, I have to get back to what I'm supposed to be doing: finishing my next book under contract, the first in a paranormal mystery series set in the Old West. I think readers who have liked my other stuff will love this. So, back to work. DAMNATION ROAD in school libraries? Yes! DAMNATION ROAD for mature readers, ages 14 and up. This is the third book in the award winning "Jacob Gamble" trilogy (Spur Awards). Yes, westerns also have series novels. The first two novels being Hellfire Canyon and Canyon Diablo. Whereas in Hellfire the reader met Jacob at thirteen-years-old, now it is 1898 and the main character is nearing fifty. The wild west is disappearing. As with many westerners, Jacob is on the wrong side of the law, sometimes on the fence, and sometimes his heart coerces him to do what's right. The reader is always hoping he will finally redeem himself and eventually go straight. Since the author grew up in Kansas and teaches at Emporia, Kansas, it's no surprise the setting of his novels are Missouri, Kansas cowtowns, and Oklahoma Territory. Will his life end like the real Oklahoma outlaw, Bill Doolin? While in the Guthrie jail, his defense lawyer ends up being the historical and colorful character,Temple Houston--son of the legendary father Sam and the model for Ferber's Cimarron (1929)main character, Yancy Cravat. Not trusting the legal system, Jacob escapes and flees to Cuba with Teddy Roosevelt's Rough Riders. Might the Colonel give him a pardon? On the other hand, there's this temptation of a big haul from a train robbery--no such luck. And there's a corrupt Pinkerton dogging his trail but also a "too good to be true" tale of a lost, Confederate treasure from the lips of a mysteries and seductive woman he can't resist. Could this be his last chance? Isn't that what the West was, a place for second chances or where one could erase the past and begin anew? 2011 winner of the Spur Award for best original paperback novel. 280 pages. Do check out the rest of his rather lengthy review... he excerpts one of my favorite scenes, featuring a cat named Killer (those who know me will immediately recognize the feline), makes some shrewd guesses about my nonfiction source material (Paul I. Wellman and Glenn Shirley), and even suggests playing the Eagles' 1973 album Desperado while reading. Right on all counts, Mr. Hicks. I'd love to visit your school library someday and do a workshop for your students. Today is the anniversary of the atomic bombing of Hiroshima. 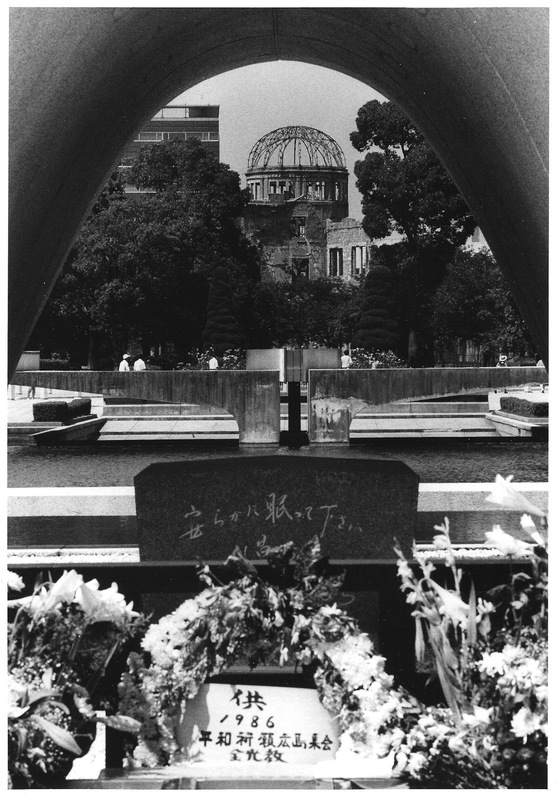 At left is a photo I made on the day of the 41st anniversary, looking through the canopy of the Memorial Cenotaph to the A-bomb dome in the distance. The dome capped the city's industrial exhibition hall in 1945 and was directly beneath the atomic bomb, which exploded in the air. The dome survived because it had a steel framework and wasn't subjected to lateral blast pressure; other buildings near ground zero were destroyed. People caught outside buildings were vaporized, some leaving only their shadows on sidewalks and stone steps. 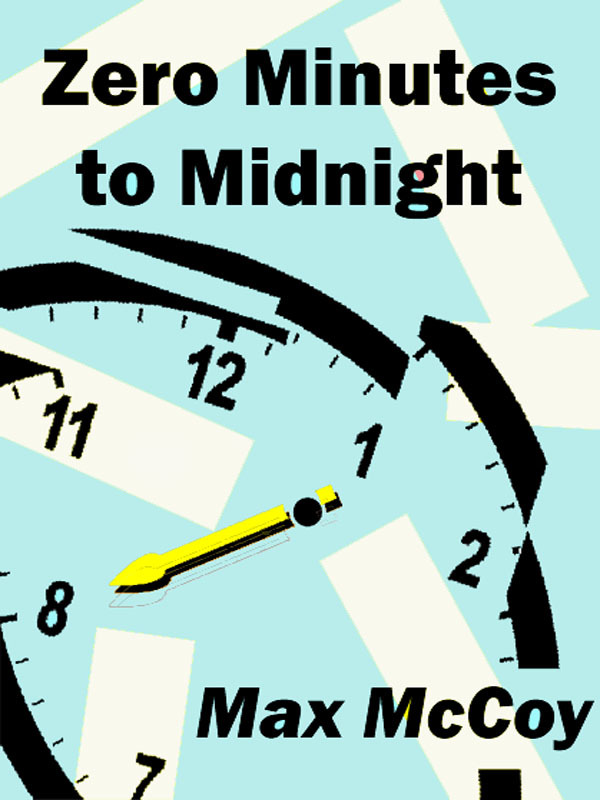 Tomorrow is the anniversary of the atomic bombing of Hiroshima, so I've been in some rush to add more photos to the companion site to my Kindle book, ZERO MINUTES TO MIDNIGHT. I'm happy to report that my photos of Yoshito Matsushige and other survivors (made in 1986) are now up. For the photo minded among you, the images were made with a Canon F1n on 35mm black-and-white Ilford film, rolled from bulk. The lens (for most of the portraits) was a 135mm 2.8, as I recall. ZERO MINUTES has been doing well since its release, and made the top ten in the bestseller category of Nonfiction... Disaster. If you have a moment, please go to Amazon and check it out (just click on the link above). Don't have a Kindle? You can download a free app that will let you read and manage Kindle books on your Mac or PC. Several people have emailed to ask if ZERO MINUTES will also come out in print, and the answer now is probably not. The digital edition, I feel, is the right format. Also, a print version just could not compete with the 99-cent digital book. Next week, Aug. 6, is the anniversary of the atomic bombing of Hiroshima. As a companion site to my Kindle edition of ZERO MINUTES TO MIDNIGHT, I have posted the only known images made in Hiroshima the day the bomb fell. They were made by 32-year-old newspaper photographer Yoshito Matsushige. I met Matsushige in 1986 and he gave me five prints he made from the original negatives, along with his captions in English. Go to the site and click on the thumbnails for high-resolution scans of each of the photos. The detail in three of the photos is heartbreaking. There are also imperfections in the negatives, where the emulsion has run or cracked; lacking a darkroom, Matsushige developed the images in kitchen trays and washed them in a nearby stream. My new Kindle ebook, ZERO MINUTES TO MIDNIGHT, which has been available for less than 48 hours, was ranked in the top 25 on two paid Amazon bestseller lists this morning. ZERO MINUTES collects my interviews with the survivors of the atomic bombings in 1986, when I traveled to Japan on a journalism grant, and adds new material as well. Forty-one years after the bombing of Hiroshima and Nagasaki, award-winning journalist Max McCoy traveled to Japan to interview and photograph the survivors. "Zero Minutes to Midnight" is the result, a nonfiction narrative in eight parts which gives voice to those who witnessed nuclear apocalypse. 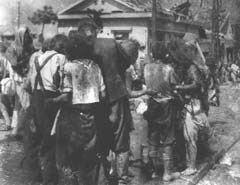 In Japanese, the survivors are called hibakusha -- literally, "those who received the bomb." Featured is the story of Yoshito Matsushige, the newspaper photographer who shot the only images of Hiroshima the day the bomb fell. A special section includes some of those historic photos, as well as black-and-white portraits of the survivors made by McCoy in 1986. In a new introduction, the author recalls the effect of that trip on his own life, and in the afterword--written in the wake of Japan's March 2011 earthquake and nuclear meltdown--he reminds us that apocalypse is always only a minute away. 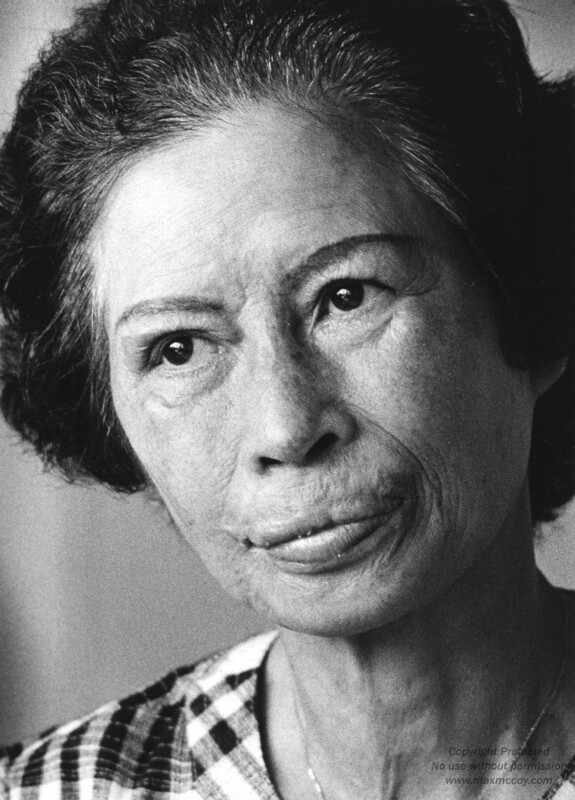 "Zero Minutes to Midnight" is long enough to present a compelling and historic portrait of the hibakusha, but short enough to read in a single sitting. Did I mention it's only 99 cents? Here I am with my friend Red Shuttleworth, rounder and poet, immediately following the awards banquet at the Western Writers of America Convention last Saturday, June 25, at Bismarck, North Dakota. Red won the poetry award and I won the mass market fiction award for Damnation Road. Actually, the award I'm holding isn't really my award, but the Spur for the writers of the HBO film Temple Grandin. There was some snafu with my award reaching Bismarck, so the HBO award was used as a placeholder for my presentation. The photo is used courtesy Johnny D. Boggs. 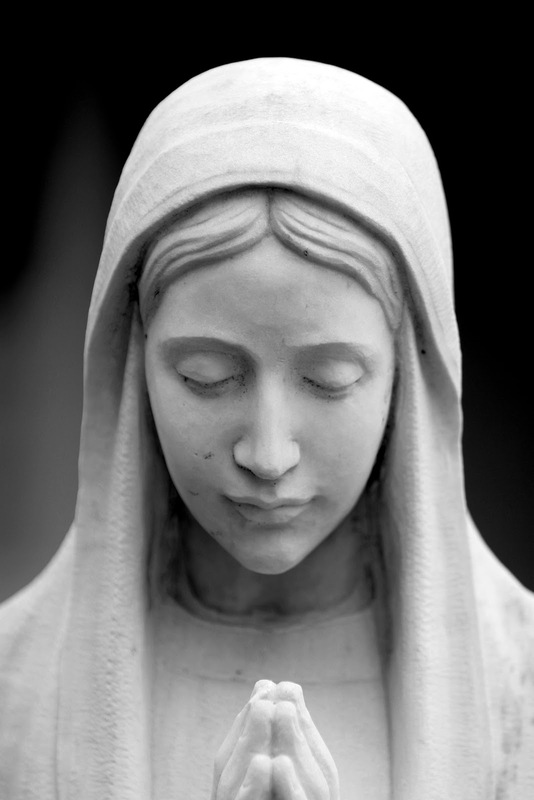 Walking around Bismarck this afternoon I spotted this statue in the courtyard of St. Mary's at Eighth and Broadway. A Marian figure, obviously. Nicely done. But what intrigued me was what lurked beneath Mary's right foot.Yes, I know it's supposed to represent a victory over evil. 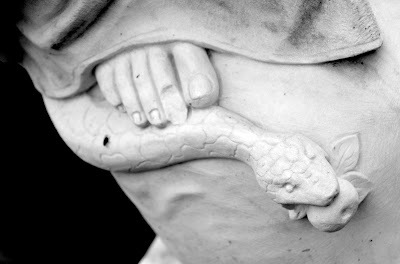 But the serpent doesn't seem quite contained... but perhaps I'm just reacting to the historic floods here, the twisters back home, the economy, the Japan nuclear crisis, a fall down the stairs. I'm in North Dakota for the annual Western Writers of America convention, and took advantage of a break in the rain to explore a bit. Surprising what you find. From now until Father's Day, June 20, THE SIXTH RIDER Kindle edition will be on sale for $2.99. That's a savings of nearly 40 percent off the regular price of $4.77 for this book, which won the Spur Award from the Western Writers of America for Best First Novel. 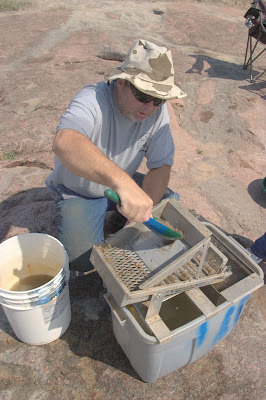 With gold topping $1,500 an ounce for the first time in history today, it seems a good time to post some photos from my gold prospecting adventure on the Llano River in the hill country of central Texas. My friend W.C. Jameson introduced me to gold prospector Earl Theiss, who graciously brought out his equipment to let me do some hands-on dredging. After briefing me on what to expect -- rocks either slick with moss or as harsh as sandpaper, water typically between three and five feet but with some holes over your head, and being prepared for a physically and mentally adventure -- he turned me loose. The dredge is sort of like a souped-up vacuum cleaner that Hoovers material from the bottom of the river into a 4-inch nozzle and spits out out into a floating sluice box. Air was supplied by a hookah rig on the dredge (I supplied my own wet suit, mask, gloves, and dive experience -- this is scuba diving, so if you'd like to try it, you'd better be certified). After gathering material for a couple of hours from the beautiful pink granite bottom of the river, and paying particular attention to cracks and crevices, as Earl instructed, we were ready to see what we got. That's Earl (left) and me transferring the stuff we collected in the sluice on the dredge into a bucket to further refine and, eventually, to pan. We were at a place called Long's Fishing Camp, north of Kingsland, and it was a beautiful spring day. Eighty degree weather. Back in Kansas, it was snowing. The end result of a half-day diving, dredging, and panning the Llano River. Not enough to retire on, but not bad for a few hours of fun. Thanks, Earl! We ate lunch at Cooper's Barbecue in Llano -- and it was the very best barbecue I've ever had, and just as good as I remember it when W.C. and Fred Bean took me there some 15 years ago. I'll be returning to central Texas on Sept. 24 and 25, 2011, to sign books at the Llano River Outdoor Expo. There will be a gold panning and metal detecting competitions and much more. And if you're interested in more about gold prospecting, geology, the history of the Llano area in general, and the local gold prospecting club, check out llanogold. The Guthrie Public Library is hosting a DAMNATION ROAD book signing from noon to 1 p.m. Saturday, May 7. The novel -- which has won a 2011 Spur Award form the Western Writers of America -- is largely set in Guthrie, Oklahoma Territory, at the close of the 19th Century. The library is at 201 North Division Street. 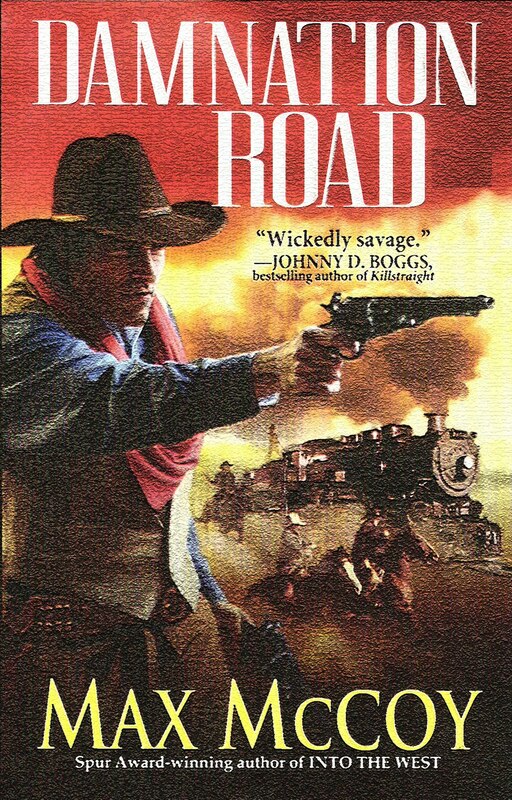 Max McCoy has won a 2011 Spur Award from the Western Writers of America for his novel, Damnation Road. Set in Oklahoma Territory at the turn of the last century, the book continues the story of irascible outlaw Jacob Gamble, who is now nearing fifty and confronted by a new west of telephones, smokeless powder and moving pictures. 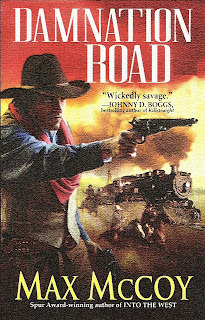 Damnation Road, which was named the best mass market original novel by the WWA, was published in September by Kensington, New York. It is the final novel in McCoy’s western noir trilogy. The first book, Hellfire Canyon, which introduced Jacob Gamble at age 13 during the Civil War, also won a Spur and was named a 2008 Kansas Notable Book by the state library. This year’s awards were announced Monday by the Western Writers of America. Other winners include True Grit, a film by Joel and Ethan Coen, for best drama, and The Killing of Crazy Horse by Thomas Powers, for best historical nonfiction. The awards will be presented at WWA’s annual convention June 21-25 at Bismarck, N.D. The Spur Awards, given annually for distinguished writing about the American West, are among the oldest and most prestigious in American literature. In 1953, when the awards were established by WWA, western fiction was a staple of American publishing. At the time awards were given to the best western novel, best historical novel, best juvenile, and best short story. Since then the awards have been broadened to include other types of writing about the West. Today, Spurs are offered for the best western novel (short novel), best novel of the west (long novel), best original paperback novel, best short story, best short nonfiction. Also, best contemporary nonfiction, best biography, best history, best juvenile fiction and nonfiction, best TV or motion picture drama, best TV or motion picture documentary, and best first novel (called The Medicine Pipe Bearer's Award). Winners of the Spur Awards in previous years include Larry McMurtry for Lonesome Dove, Michael Blake for Dances With Wolves, Glendon Swarthout for The Shootist, and Tony Hillerman for Skinwalker. Last week was Sunshine Week. It is especially fitting that on Friday Judge Maryann Sumi issued a stay of Wisconsin's controversial bill that would limit the collective bargaining rights of most state workers, on the grounds that the lawmakers violated the state's Open Meetings Law. In her ruling, Sumi said that Wisconsin residents own their government. "And we own it in three ways," she ruled. "We own it by the vote. We own it by the duty to provide open and public access to records, so that the activities of government can be monitored. And we own it in that we are entitled by law to free and open access to governmental meetings, and especially governmental meetings that lead to the resolution of very highly conflicted and controversial matters. "That’s our right. And a violation of that right is tantamount to a violation of what is already provided in the Constitution, open doors, open access, and that nothing in this government happens in secret." A district attorney had brought the Open Meetings complaint, alleging that Republicans did not observe the 24-hour public notice requirement before convening a conference committee. Democratic legislators had fled the state in an attempt to halt passage of the bill. Sumi ruled that the public did not have ample time to attend the meeting. Walter Zacharius, founder and former CEO of Kensington Books, passed away this morning at the age of 89. Kensington was founded in 1974 by Mr. Zacharius, who previously had been one of the founders of Lancer Books. Walter started Kensington with a little capital and a big dream. In the 36 years that followed—a little fish in a big pond (and one filled with sharks)--Walter defied all the odds and built Kensington into a major publisher with a number of current and past NY Times and USA TODAY bestselling authors, among them Fern Michaels, Lisa Jackson, William W. Johnstone, and many others. He also discovered a good number of authors who would go on to have careers at many of the major publishing houses, including Simon & Schuster and Random House. Kensington currently has close to 100 full time employees and publishes and distributes more than 400 titles a year in mass market, trade paperback, and hardcover. But it was the western that was, and continues to be, a big part of Kensington’s success. From Zane Grey to Ernest Haycox to Johnny D. Boggs and Max McCoy, Kensington did ‘em all. And when conventional wisdom said that the western was all but dead as a category, Walter reacted as he always did—he charged head-first into the category and filled the void left by the other publishers. With great success. Till the end, Walter was a huge supporter of the western and of the WWA. When Richard Wheeler won the Spur Award for Vengeance Valley in 2005—Kensington’s first such honor in more than three decades of publishing Walter was so proud that he displayed the publisher’s plaque on his office wall right next to a picture of his grandchildren. The plaque is still there. Walter Zacharius was the last of a breed—a maverick independent in an industry now run by corporate wonks. Max McCoy is an award-winning novelist and investigative writer. He teaches journalism and mass communication at Emporia (Kan.) State University. This blog represents his personal views on matters of public interest. He makes no claim to speak for his institution, his publishers, or any party other than himself. Copyright 2007-2011 Max McCoy. Photos are not public domain and may not be used without permission. Awesome Inc. theme. Powered by Blogger.